Editor’s Note: This post was written by OSH guest poster Monica Sakellaridis a.k.a. Mozey. See the end of the post for more information about Mozey and where to find her online. I fully believed that my husband would come around and support my decision to follow our son’s cues and follow natural-led weaning. I was confident that once my husband saw the beautiful and unique relationship that breastfeeding created between my son and I, he would be supportive. Thankfully, I was right. Not only did my husband become supportive of breastfeeding, but he has also become a supporter of long-term breastfeeding and natural-led weaning. So often the support that a mother has for breastfeeding, or lack there of, is the tipping point between breastfeeding for a long time, for a short time, or not at all. Why did my husband change his mind? Why do some partners support breastfeeding and some do not? These are questions that I have often asked myself. 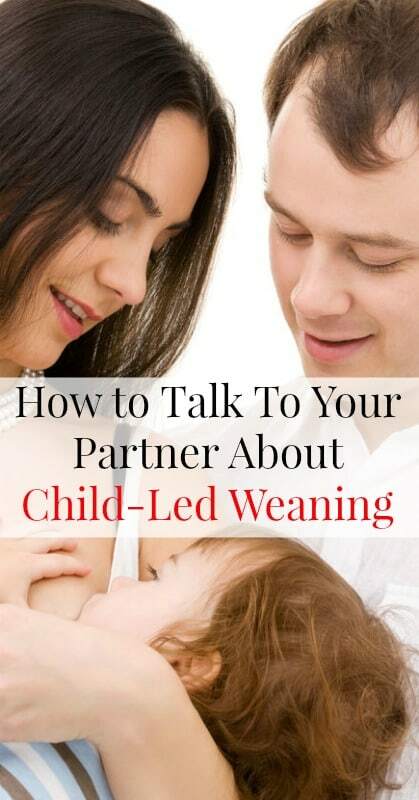 I have friends whose partners thought that they would be supportive of whatever amount or length of time that my friends wanted to breastfeed, only to find themselves responding oppositely and becoming unsupportive after their child reached a certain age. And then there’s my husband, who thought that six months was enough, but once the breastfeeding relationship blossomed and bloomed, decided that the length and amount of breastfeeding was a decision to be made between mother and baby and that his role was to support that decision. There are numerous studies supporting the benefits of breastfeeding. Clearly humans were supposed to be nursed by their mothers, it is in our design. So, what then is the issue? The issue, I believe, lies far deeper than whether or not breast milk is the ideal food for a baby. I feel the issue lies in how stable and bonded the mother and father are to each other, how much the mother and father trust and support each other, and how open the communication is between them. Having a baby, tests all of these aspects of a relationship. Breastfeeding, further tests these aspects and it brings into question the couples willingness to make decisions together and then support those decisions. My husband and I were new parents and our relationship was also new. We had only been together for 3 months before I became pregnant and consequently a year when our son was born. We both came from very different backgrounds when it came to breastfeeding. My family are huge supporters of breastfeeding. My mother breastfed me and my three siblings, except my handicapped sister who was unable to breastfeed; my mom pumped exclusively for her! My mother let each of us naturally wean and we all breastfed for 2-3 years. My husband, on the other hand, was the longest breastfed baby in his family and his mother breastfed him for seven months. His two siblings were each only breastfed for 2-3 months before being switched to formula. Breastfeeding is NOT the normal thing to do in his family, whereas formula feeding is NOT the normal thing in mine. Two totally different upbringings and outlooks towards breastfeeding. Even with all that juxtaposition, I knew in my heart that he would support my decision to breastfeed for as long was comfortable for my son and I. Set aside some time to talk about breastfeeding, your hopes, fears, and questions. By setting aside real time to talk, you and your partner will be more likely to be ready to discuss and be supportive of each other’s feelings, rather than be caught off guard and possibly put on the defensive. Do not invalidate each other’s feelings. If you have differing opinions, be willing to agree to disagree. There are going to be many times in your parenting adventure together where you will disagree (discipline, anyone? ), start practicing the ability to agree to disagree now. This will help you avoid many conflicts and help you both keep level heads when talking about touchy subjects. Don’t be shy to ask other parents questions about breastfeeding and how it has affected their relationship. Ask couples who have relationships that you admire and want to emulate. Set up a network of family and friends who support breastfeeding, so that when you need it, the support is there! You may plan, you may be on the same page at the start, but when the time actually comes, issues may come up that you never thought of. Do your best to cultivate open communication with your spouse from the beginning so that you may weather any storms that breastfeeding and parenting bring your way. I had a lot of “plans” for breastfeeding, co-sleeping, and parenting that I thought I was going to do when I was pregnant with my first child. Ultimately, when he was born, a lot of things changed. I learned to trust my intuition and do what felt right for my son and me. I breastfed him as long as was mutually comfortable, which turned out to be 4 ½ years old! It was a surprise to me that he wanted to nurse that long! I thought that he would naturally wean from breastfeeding when his little sister was born, but we ended up tandem nursing. I had to do a much more regimented approach to weaning than I thought I was going to have to do, because I found that it was no longer comfortable for me to breastfeed such a large and old child. I was very happy that he and I were able to talk about weaning and he was able to understand why we were stopping breastfeeding. It felt natural to take this approach. Different weaning approaches have worked with each of my children, just as each breastfeeding relationship has also been unique. Trust your intuition! Breastfeeding has been an awesome adventure and one that I could not have enjoyed as much without my husbands support, love, and understanding. Having him stand behind my decisions has been paramount to my breastfeeding success and confidence. It was a little tricky at first to discuss our differences and come to a place of agreement, but by being open with each other and respecting each others feelings and opinions, we made it! The work it takes to have a successful relationship with your spouse is absolutely worth every bit of effort. Trust the process. Trust yourself. Trust each other.